What is the best way to get to Cozumel? You’ve landed at the Cancun airport and now you need to get to Cozumel. The trip from the Cancun airport to Playa del Carmen will take approximately 1 hour depending on traffic and the ferry to Cozumel approximately 40 minutes. 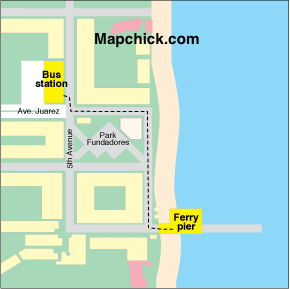 There are two ways to get from the airport to the ferry that will take you to the island. We’ll start with cheapest, if you are a solo traveler or a couple, taking the ADO bus from the airport to the Playa del Carmen bus station, from the bus you can simply walk to the ferry dock. The bus from the airport departs approximately every 30 minutes beginning at around 8am until 11pm, the cost is 208 pesos, about $10.00 us. For two of us the cost is $20.00us plus any tips. This is the cheapest way to get to the ferry, but not usually the quickest. You can check the ADO bus website for times and if there are price changes. Next would be to arrange for a shared shuttle from the airport to the ferry. Again, for one or two people this is quite economical and normally faster than the bus. Best Day is the only company I know of who offers shared shuttle service from the airport. The cost is $28.00us per person. For two of us the cost is $56.00us plus any tips. Happy Shuttle is a new favorite of mine, very good service. Coupon code Mapchick10 for 10% discount! Note: Prices shown under Quintana Roo Plan are for residents not tourists. There is one other ferry service from Playa del Carmen to Cozumel, it leaves from the same dock as Ultramar. People will try to sell you ferry tickets along the way, just keep walking and wait until you reach the terminal to buy, we always buy tickets for the next ferry to leave. Your private shuttle and shared transfer will drop you near the bus station. If your plane is late and you can’t make the last ferry, you’ll need to spend the night in Playa del Carmen and go to the island in the morning.